to lifelong health and wellness? 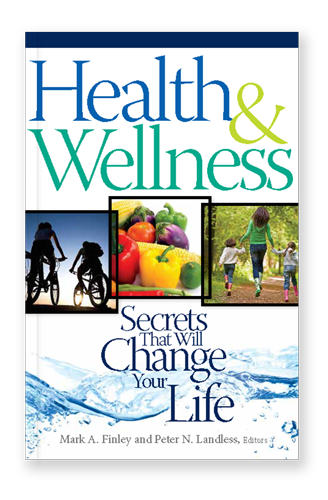 Health and Wellness: Secrets That Will Change Your Life shows you spectacularly simple ways to avoid chonic killers such as cancers, diabetes, heart disease, and obesity. You will learn how good nutrition heals the body and boosts the mind; how exercise increases longevity; how love and forgiveness mend the heart! Are you at risk for deadly disease? Take a look at some startling facts from around the world. Depression, take a hike. These simple medical principles show how to cure cure emotional lows. You will read about how killer diabetes is not just in your genes. Learn what you can do to avoid it. You know what kind of gas and oil to put in your car. Do you know what kind of food to put in your body? Domestic violence doesn’t just hurt the ones behind closed doors; it impacts the entire community. Find out how. Does your body move enough to keep in top shape? Quiz yourself to find out. Is there a link between healthy relationships and healthy bodies? Yes. Here’s how. Join us for even more tips about how to enjoy vibrant health and wellness. Have you ever tried slimming down, but been disappointed every time you step on the scale? In this video, you will learn the science behind losing weight and more practical tips. Text: Love to eat but not sure how to cook healthy cuisine? Join us for one of our step-by-step cooking shows to learn how to make food that tastes great and leads to better health! Browse some samples below-then download the whole book! It’s free and you have nothing to lose (except illness and disease). The estimated global healthcare services market for 2015 is $3 trillion, which makes the healthcare industry one of the largest sectors of the world economy. In most developed countries, health care consumes more than 10 percent of the gross domestic product. We are much more valuable than we may appear at a casual glance. Take the human body, for example. When researchers add up the chemical value of our body’s component parts, they might conclude that we are not worth much. Yet even then, Wired magazine estimates that if we consider the monetary value of our hearts, lungs, kidneys, DNA, and bone marrow, we are individually worth up to a whopping $45 million. As you consider your personal health, you will recognize that to achieve life’s greatest happiness you will probably need to make some positive steps. But rather than overwhelming yourself with multiple changes, choose to begin by taking a few small steps at first. For example, as you succeed in increasing your exercise, or reducing the amount of sugar and refined foods in your diet or getting more rest, your resolve will increase, and your ability to make healthy choices will become stronger. Good health is a state that we all desire, but sadly, many people realize its worth and value only once they’ve lost it! Here is an opportunity for you to evaluate your health and lifestyle carefully, not just hastily make a few resolutions that rapidly fly out the window. Do you feel that you’re getting the best out of life in all its facets? Have you recently assessed your total health, including its physical, mental, social, and spiritual aspects? You may assume that you manage your day-to-day routines of eating, working, and sleeping quite well. But are you enjoying a real quality of life? Have you ever considered that life may have much more to it than you are currently experiencing? You may be feeling good up to now because you do not smoke tobacco or drink alcohol, but what about your diet and salt intake? The foods we choose to eat largely produce the various noncommunicable diseases. At least 40 percent of all deaths from these kinds of diseases result from the consumption of foods high in saturated and trans fats, salt, and sugar (and refined carbohydrates). Are you selecting your foods wisely and carefully, focusing on variety and good nutrition within the bounds of your budget? Simple actions such as cutting back on salt, reducing food portion sizes, and eating more fruits and vegetables can make a huge difference to your health. Of course, to enjoy the best health possible you should be exercising daily. You might say, “I get up off the couch for a snack during every TV commercial, and I walk the 100 meters from my house to the grocery store.” But do you have a regularly planned, systematic exercise program? What about your interpersonal relationships? Do you have friends you care about, younger people you mentor, individuals in need whom you help? Social support and connectedness to God and others are also health-giving! Perhaps you have broken relationships in your life that need mending. Keep reading. God has a plan for you that is far better than you can ever imagine. Are you happy? Do you wake up with purpose, walk with “pep in your step,” and have a smile on your face? Or has life become too much? Are you anxious or downhearted? Does the future look bleak? Do you struggle with dark thoughts of meaninglessness, failure, and defeat? As we explore scientific facts and discover life-changing spiritual principles that we can universally apply, you will see that the possibility of happiness is real. In God we will find rest and hope for the future. God has given us a road map and instructions on how to have health and wellness—now and beyond, and even into eternity! We were born for something much more than just struggling through a few decades and then dying. God intended for us to live the abundant life today, tomorrow, and forever. God has a plan for your life that is far more than amazing. As His personal concern, He wants you to live life in all of its fullness. He longs that you experience joy beyond measure. Heaven’s plan for you is a life of physical, mental, emotional, and spiritual wholeness. Research has shown that supportive relationships strengthen the immune system and increase our ability to fight off illness and disease. One such study indicated that just three weekly visits by relatives and close friends improved the immune function in the seniors.1 The other side of the coin is also true. Scientific investigation has documented that abusive relationships may damage our health. Exposure to physical, sexual, or emotional violence, or the ongoing stress related to abuse, has links to many health problems. Adverse childhood experiences appear to produce several physical health problems later in adulthood. The traumatic childhood events include “verbal, physical, or sexual abuse, as well as family dysfunction,” such as witnessing adult domestic violence.2 It is tragic that oftentimes those who have the strongest bonds to a human being—one’s own family—can perpetrate such acts of violence. The home, which should be a little heaven on earth, a shelter and safe haven filled with warmth and love, can become a place of harm, danger, and fear behind closed doors. Such an unhealthy environment becomes a source of chronic stress, possibly resulting in disease and even death. Adults who have experienced child abuse have up to a 60 percent higher risk for diabetes.3 Studies of childhood neglect have also found an increased risk of diabetes.4 The current pandemic of diabetes makes such facts both startling and worrying. Who would have thought that diabetes could have anything to do with the type of relationships we have at home? But such negative physical health effects go beyond that of diabetes or the immune system. Traumatic experiences in childhood appear to have a role in cancer, cardiovascular disease, obesity and being overweight, and early death.5 The evidence strongly suggests that if excessive stress weakens the immune system in childhood and abuse damages the delicate mechanisms of the mind, multiple physical, mental, and emotional problems may surface later in life. Experiencing childhood maltreatment and poverty at an early age harms our immune system. The bodies of those who have endured such a background often show, when they become adults, an abnormal control of inflammation because of faulty immunity. They also have an increased risk for diabetes! Such immune system dysfunction appears not only in the case of child abuse, but also during adult conflict between spouses and companions, especially if it continues for some time. Research has linked abuse and violence in all its forms not only to increased mortality but also to having a negative influence on the entire community. Globally, violence and abuse have become major problems. epression is a global problem that can affect anyone anywhere. Statistics reveal that more than 350 million people of all ages suffer from it. The leading cause of disability worldwide, it is a major part of the global burden of disease. Those who study the patterns of disease predict that such figures will only increase in the future. The World Health Organization describes depression as “a common mental disorder,” characterized by sadness, loss of interest or pleasure, feelings of guilt or low self-worth, disturbed sleep or appetite, feelings of tiredness, and poor concentration.”1 At its worst, depression can lead to suicide. An estimated 1 million people die depression-related deaths each year. This is even more disturbing when we realize that a number of positive principles and effective treatments can make a major difference for people dealing with depression. Even a better standard of living does not ensure happiness. “Based on detailed interviews with over 89,000 people, [study] results showed that 15 percent of the population from high-income countries, compared to 11 percent for low/middle-income countries, were likely to get depression over their lifetime, with 5.5 percent having had depression in the last year.”2 As we see, money is not a solution to disappointment, discouragement, and despair. The same research shows that women are “twice as likely to suffer depression as men, and the loss of a partner, whether from death, divorce or separation, was a main contributing factor.”3 The cause of depression is not the same for everyone. For some, it is a genetic problem that affects the balance of chemicals (neurotransmitters) in the brain. For others, a stressful life event, such as the death of a loved one, losing a job, a divorce, or some equally distressing life event, may trigger it. In many cases, depression occurs as a result of the combination of both the chemical imbalance and a triggering event. Whatever the cause, whether it is a chemical upset in the brain or the heartache of some major life event, depression can harm a person’s life and needs effective solutions. Depression can be very disabling. Millions of people live in the dark shadow of sadness, gloom, and hopelessness, and often struggle with feelings of inadequacy and worthlessness. While there are degrees of depression—and we all experience minor versions of it—almost 22 women out of every 100 will have an episode or more of major depression during their lifetime. That is almost double the chance of such an event occurring in men. Approximately 13 out of every 100 men during their lifetime cope with some form of depression. Children up to the age of 10 may also experience depression, though the gender difference is not apparent until the reproductive years during and after adolescence. Once they pass menopause, though, women become less prone to depression. Multiple factors make women more susceptible to stress- induced depression than men. They also are about four times more prone to seasonal-affective depression than men. It is the form of depression that occurs in areas where winter daylight hours are very short. People wake up and go to work in the dark and return home in darkness, and have little exposure to sunlight. Yet another factor that may influence the onset of depression is the hormonal fluctuations of the reproductive years. They may well affect neurotransmitters in the brain, increasing vulnerability to depression. Women in many cultures do not enjoy equal status with men, something that could also play a role in depression. The demands placed upon women to produce children or to regulate family size mean that they often carry disproportionate responsibilities and accountability for reproductive function. Infertility or a miscarriage may get viewed as a failure to fulfill their role. Oral contraceptives may carry a potential for depression in susceptible women. Hormonal factors may play a cyclical (occurring monthly) role or during the postpartum state following childbirth. Whatever the causes, women with depression need and deserve serious and compassionate care. The symptoms of depression vary from person to person. Persistent tiredness and loss of energy are common complaints among those suffering from it. Depressed individuals may suffer from loss of concentration and become indecisive. Feelings of guilt and low self-worth often persist for weeks and even months at a time. Some may experience difficulty in sleeping or, on the other hand, sleep more than normal. Many find themselves waking up early. Persons suffering from depression tend to lose interest in daily activities. They may struggle with recurring thoughts of death and suicide. Changes in eating patterns may cause either weight loss or weight gain (a change of more than 5 percent of body weight in a month). In severe cases, individuals with depression lose interest in eating and no longer find pleasure in any of life’s activities, including social relationships. Society needs to recognize that the major depressive disorders are as much a disease as the more physical ones, such as diabetes or hepatitis. Ill-advised comments such as “pull yourself together” or “get a grip” reflect either a lack of knowledge or, even more sadly, the ignorance of the one making them. Such statements may cause further pain, heartache, and a worsening of the depression. What happens when the necessary time for sleeping is disregarded? In 2011 a Chinese man died after a three-day marathon he spent in front of the computer in a cybercafé almost without eating and drinking. Two years later, in December 2013, MitaDiran, a young employee of the advertising agency Young & Rubicam in Indonesia, worked continuously for three days. She used energy drinks to keep awake. But the price she paid for her extravagant dedication was death. It’s amazing how bleak and gloomy the world can seem when seen through eyes drooping from sleep-deprived exhaustion. On the other hand, the sense of rebirth and renewal after a long night of deep sleep is totally refreshing. After all, if God created human beings to work (Tawrat, Genesis 2:15), He also created them to rest. By partaking of the blessing of sleep, and the blessing of balanced, productive work, we can enjoy optimal physical, spiritual, and mental well-being. Scientific research is clear: as human beings we need sleep. Without enough of it, we cannot function properly. Everyone, whether they will admit it or not, knows how important sleep is. Yet despite years of study, it still remains a mystery. Exactly what it is, what it does, and why it affects our bodies and minds the way it does are questions that still need many answers. We do know that sleep is essential to health and well-being. While it does not guarantee that you won’t get sick, the lack of it means that sooner or later you will. How much sleep is enough? The answer varies, because people, their health, their work habits, their age, and their metabolism vary. For practical purposes, most people need about eight hours of sleep a night (some studies put the range between seven and nine hours). It is the optimal amount necessary to experience sleep’s full benefits. Besides just helping us feel rested and better emotionally and physically, sleep helps fight off infection, prevents diabetes, and reduces the risk of heart disease, obesity, and high blood pressure. Despite laborsaving devices, jet travel, and high-speed Internet, we are not getting enough sleep. You would think that with everything being done faster, we’d have more time to rest and relax. But many around the world are sleeping less than the recommended seven to nine hours. In addition, an increasing number of people have sleep problems, with many millions suffering from some type of chronic sleep disorder. Lack of sleep leads to decreased performance during the day. Reducing sleep by even one and a half hours, even for just one night, results in a drop of daytime alertness by as much as 32 percent. Furthermore, lack of sleep weakens memory and cognitive skills. And who hasn’t experienced the added stress caused by someone’s crankiness or irritability from not enough sleep? Workplace accidents are twice as likely to happen in cases in which one of the workers didn’t get sufficient sleep. The National Highway Traffic Safety Administration (NHTSA) estimates that each year drowsy driving leads to at least 100,000 automobile crashes, 71,000 injuries, and 1,550 fatalities just in the United States. Because problems caused by lack of sleep affect those around us as well, it becomes, therefore, our responsibility to get adequate sleep and rest.